Sydney is known for it's beautiful harbour first and foremost. Sydney is a vibrant city that provides ample ferry services to different Sydney Harbour ports, unlike many other Australian capital cities. On that, which ferry route do you enjoy taking? The Manly ferry? The ferry to Taronga Zoo? Maybe to Watson's Bay? During the Fleet Review I caught the Darling Harbour ferry for the first time and I have to say it was a pleasant surprise. We got to see the city from a different angle and the ferry stopped at several points along the way including Balmain and Luna Park. For me it was the excitement of doing something I haven't done before. 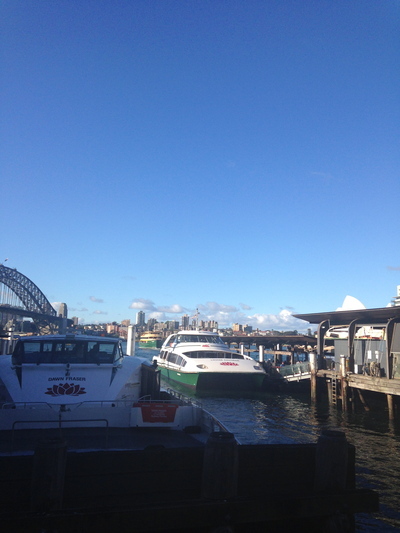 The Manly Ferry is the ultimate choice, however a ferry to Watson's Bay is great. A great way to unwind, and enjoy some seafood lunch on the harbour. I think the ferry from Parramatta to Circular Key gives you the most bang for your buck. Tourists to Sydney should consider taking an historical tour of Parramatta for a day and then heading back via ferry. (check out your ticket options first at the train station, a My Multi 2 might be the best way to go). The River Cat is fun and you get to pass right under the bridge and look up and admire its majesty. The ferry is always the best way to get to Taronga Zoo, but you can also take it to Balmain, Homebush Bay and Cockatoo Island. I've done the trip to Cockatoo Island a few times now and am always amazed at how stunning it is, and how fun it is touring around the island and showing it to people new to Sydney.